A Cylon attack force boards the Galactica! 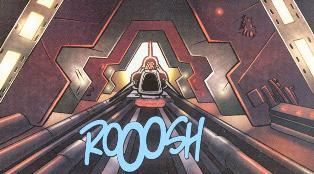 Continuing from last issue, Stadra has been shot in the back by the Cylons and dies instantly. Starbuck manages to run back to the banquet room and warn the Commander. The Cylons also make their way there and a firefight begins. Another squad of centurions, led by an IL-series Cylon, takes the bridge from Colonel Tigh. In the banquet room, Adama and the other warriors get the civilians out through the air vent. Freg races off, saying he's going to face the Cylons eye to eye. Meanwhile, with the bridge taken and a baseship showing up at their doorstep, the situation looks hopeless for the fleet. Adama gets on the shipwide emergency com and orders all pilots to their vipers to protect the fleet. As the battle in space rages, Adama is captured and taken to the bridge where the IL can gloat over its victory. Adama suddenly utters the vocal command code telling the Galactica's computer to set the ship to self-destruct. The Cylons prepare to flee the ship, still ensured of victory, and the IL orders one of his centurions to kill Adama first. Just then, Freg blows open a wall and comes in firing. Adama is spared as the Cylons flee the bridge and blast off in the transport. Through dialog, we learn that Adama had sent Freg to the munitions room, where he found and planted bombs on the transport. When the ship enters the docking bay of the basestar, Muffit, watching the action on a video monitor, triggers the bombs remotely, destroying the transport, which takes the basestar with it. The remaining Cylon raiders are wiped out by the viper squadrons. Later, the fleet celebrates, but Starbuck prefers some solitude over the loss of Stadra. Throughout this five-issue story, Starbuck is depicted a bit more cocky than he was on the show. Yes, he was always cocky, but there was more subtlety to the dialog and performance than we see here. After taking control of the Galactica bridge, on page 5 the IL-series Cylon orders Colonel Tigh to have his "communications daggit" open a channel to Maytoria to inform the Cylon fleet of the success of the mission. An interesting choice of derogatory humor by an IL. On page 7, Boxey confronts Apollo with his promise that the Cylons would never get onto the Galactica like they have. This refers back to their conversation in "Behind Enemy Lines". On page 11, panel 6, the artist must have used photo reference for the viper launch tube. Looks just like it, even the protuberances on the right-hand side. On page 13, Adama utters the vocal command code telling the Galactica's computer to set the ship to self-destruct. The last word of the command phrase is "Ila", the name of his wife. Despite his (its?) declaration to Baltar in "Deathtrap" that the modern Cylon Empire can live in tolerance with the humans, on page 17, the new Imperious Leader seems to have approved of the IL-series' plan to destroy the human fleet. Throughout the story, we never learn the name of the IL-series Cylon commanding Maytoria. And how did it know to hide himself and his Cylon officers on the personnel carrier to spring an ambush on the humans in the first place? Possibly the Cylons captured someone alive after storming the guerilla stronghold in "Behind Enemy Lines" and tortured the guerillas' plan out of them. On page 20, Freg's daughter asks if she can go play with Boxey and his muffet. Er, I think she means daggit. On the last two pages of the story, Starbuck is brooding in what appears to be his quarters. But, in earlier episodes, it seemed that all the pilots (with the possible exception of Captain Apollo) stayed in a single barracks room. We've reached the end of the story, yet we never learn whether the information/books retrieved from Maytoria actually provided the fleet with any information on the whereabouts of Earth. Perhaps it is due to this source that the fleet finds itself in the vicinity of "the void" that eventually leads them to Kobol in "Into the Void"?